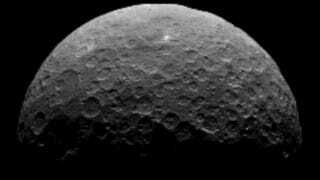 NASA’s Dawn spacecraft is settling into its first orbit around dwarf planet Ceres. And as you can see from this newly released animation, the view is getting to be quite spectacular. These images were taken by Dawn on April 14 and 15 from a distance of 14,000 miles (22,000 km). Each pixel represents about 1.3 miles (2.1 km), making this the most hi-res image yet taken of the dwarf planet. Dawn will begin its first circular orbit on April 23, so we can expect even better photos over over the next few weeks and months. The animation also shows the pair of two bright features, dubbed spot 5, rotating into view in the last few frames. Click here for wallpaper versions of the processed still image (shown above).